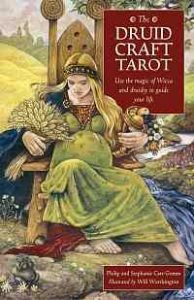 Just for fun, I have rounded up my top ten Tarot decks! Out of all the decks in my Tarot deck collection (and there are many), these are the decks I go back to again and again. As an adventurous and promiscuous Tarot lover, I may scamper off with other decks from time to time just for the thrill, but I always return to these ones because I know I’m always guaranteed a satisfying, soul quenching reading. These decks are in no particular order. I love #1 just as much as #10! For many years I have been waiting to find THE perfect Tarot deck. A deck that just clicks with me and makes me feel at home. For me, this is that deck. There is so much I love about this deck – the nautical theme, the mermaids, the hand written card names, barely-there borders, matte finish, blah, blah, blah….but the real magic is in the energy of these cards. This is a one of a kind, special deck – not just visually, but energetically. I feel like I am truly tapping into my gypsy, tarot reading self when I read with these cards. When I first saw the Osho Zen Tarot deck I didn’t like it at all. I don’t know why, but it seemed almost too simple. Then a few years later, I saw it again and absolutely had to have it! Since then I have spent hours working with these cards. I find them to be excellent at getting to the real meat of a situation – the deep, underlying issues that need to be recognized. If your into things like Eckhart Tolle, Eastern spirituality and meditation, then you will really enjoy working with this deck. It’s not “new-agey” or anything like that, but if your interested in understanding the inner workings of your self, ego and mind, then this deck will help you along the way. I think that both men and women will equally enjoy this deck – many Tarot decks are a bit girly and fluffy, but not the Osho Zen. Read my full review of this deck! There is so much I could say about the Hezicos Tarot! Whimsical, fun and insightful, I love using this deck for self readings. The images and symbols on the cards really pull me in and I find myself going on a mini-journey into my self each time I read with this deck. 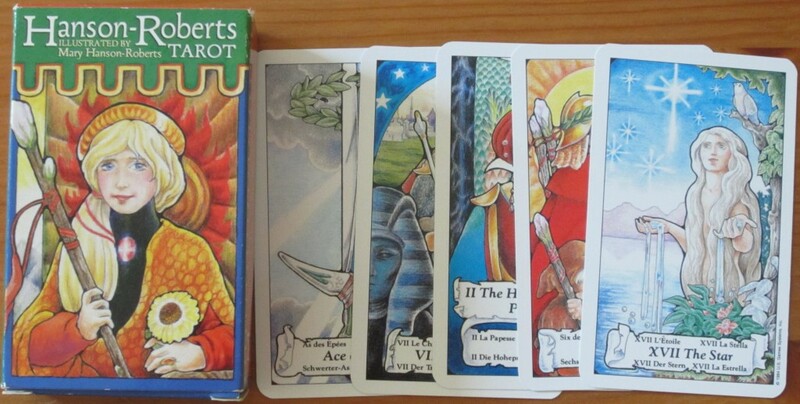 Here is a good old, classic Tarot deck! I always recommend this deck as the deck to learn on, because if you learn with this deck, you will be able to easily read with most other decks that are based on the Rider-Waite structure and symbolism. To be perfectly honest, this deck isn’t my favorite deck to read with, but it is one of my favorite decks to meditate with and to study. This deck has been a long-standing fave of mine. I ended up trimming my deck to get rid of the annoying white borders, so the cards in this photo look a bit different from when I first got them. This is a gentle and mystical deck with a girly vibe. I like using it for professional readings because there are no scary looking cards and everyone seems to love this deck. Now here’s a succulent, colourful deck that’s just bursting with 1970’s sexiness! Handlebar mustaches and fertile flowers bloom unfettered by mojo-killing borders. This is one of the few decks out there that is borderless – and thank God for that! I accidentally bough the Spanish version of this deck – which is actually a good way to learn a few Spanish words – but you might not want to do that if your a total beginner who doesn’t speak Spanish! 2. Cards are quite small – like a mini deck – and can easily be carried in your purse or pocket. This makes them easy to handle and less intimidating than a full size deck. 3. Images are fairytale-ish and even a bit childish, which gives the deck a gentle feel to it. This deck is super atmospheric and gazing at these cards can transport you to another world – especially if you’re the spacey-outey type like me! I love using this deck for both professional and self readings. My only gripe is that the cards are very detailed and so I find myself squinting a bit. But nobody’s perfect! This is one of my most “down to earth” decks – when I read with this deck, it just makes sense, especially as it pertains to my everyday life. 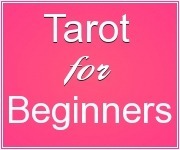 The cards closely follow the Rider-Waite-Smith imagery, so this is a great deck for beginners to learn Tarot with. This deck has major personality! The people on these cards can sometimes seem a bit fugly, but they’re always easy to relate to. 1. Big cards! Yes, it makes it impossible to shuffle but the cards act as windows into a different realm. A realm I want to endlessly scamper about in. 2. Druidy vibe and magical feel – you really feel like your using a special deck of cards when you do a reading with the Druidcraft. 3. The companion book – if you can, it’s worth it to get the book and deck set. I usually ignore most companion books, but this one has a lot of good info and fun spreads and stuff. You will want the book especially if you’re interested in druidry or earth based spirituality. What are your favorite decks? In the comments below, tell me what Tarot decks light your fire. Which decks feel like a comfy, monogamous relationship? Which decks do you rely on for good, solid readings? This entry was posted in May 2015 and tagged best tarot decks, favorite tarot decks, tarot blog, top 10 tarot decks, top tarot decks. Bookmark the permalink. That was fun to connect the dots between the visuals and the decks we’ve talked about before. 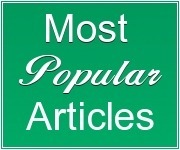 You know me – my “top 10” is basically a list of the ones I own, so this list goes in a pecking order. Thanks for sharing your top 6, Ronda! Out of all of them the only one I’ve used is the RWS, but the Animal Wise one intrigues me. I prefer the ancient decks, or the decks based on them; the Visconti Tarots, The Golden Renaissance Tarot, and The Medieval Tarot immediately come to mind. For modern decks, being twenty years or newer and not based on TdM style exactly, I really like using Dame Fortune’s Wheel Tarot by Paul Huson. A lot of research put into that one. I have about a hundred decks give or take a few, and I appreciate many decks. But those mentioned tend to be my favorites. Thanks Marilyn, for sharing your favorites 🙂 I actually don’t have any of those decks but I have heard good things especially about the Dame Fortune deck. One deck that comes to mind is the Nostradamus deck – it’s a newer-ish deck but has an ancient look to it. Thank you for creating this wonderful blog. 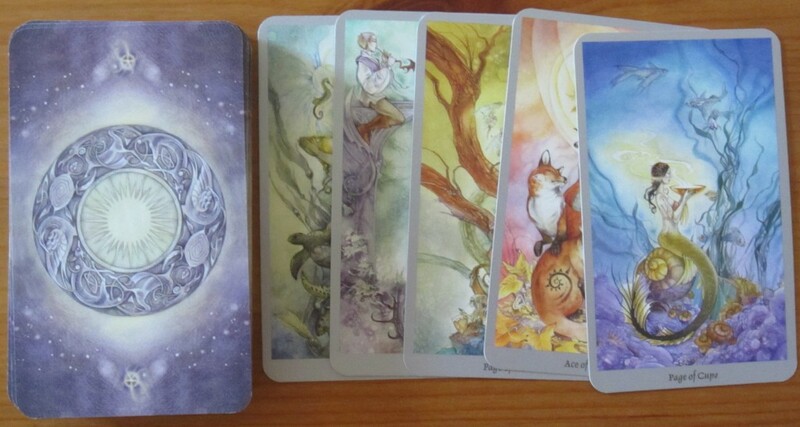 I bought the Shadowscapes Tarot because of your reviews and I am in love with it. The Hezicos Tarot is also on its way. I wonder if you have any idea on the Inner Child Tarot to share. I am thinking of buying the deck. Thanks. I don’t know of the Inner Child Tarot so I can’t give you my opinion on it – but let me know if you end up getting it and how you like it. I have only 3 Tarot decks at the moment..The first two decks chose me rather than the other way around..the third one I only bought today. My second deck is the Witches Tarot. I am finding this a little easier to read, as it is based on the RWD. It comes with a very in depth guide book. The card which drew me to select this deck is the “Moon” card. I love the details in this deck. My most recent deck is the Angel Tarot by Doreen Virtue. This deck I am finding to be non-confrontational, which would make it an ideal deck for doing readings for others. Money, and the Law of Attraction – Esther & Jerry Hicks. I can have a good conversation with the Spirit Messages deck.. Just like a good friend.. Thank you for a great Post!.. The Hezicos Tarot – Thank you Kate for showcasing this deck. 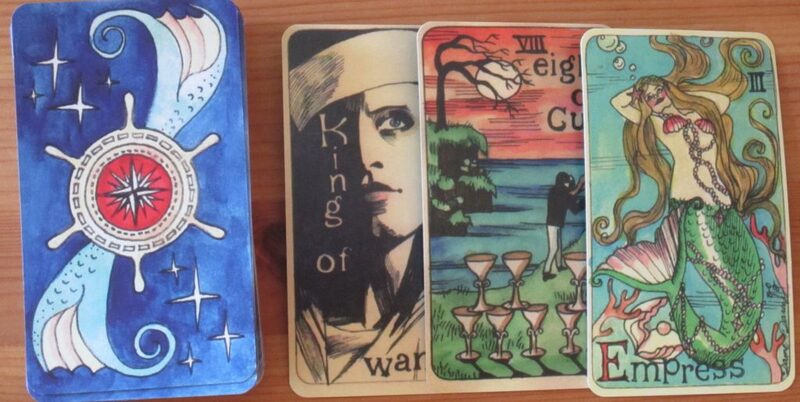 The Dame Darcy tarot – I wanted a nautical themed deck which I love and now I have it!. Morgan -Greer – I don’t work energetically with the RWS, so this is my version of it. The Victorian Fairy Tarot – Not usually my thing victorian, but this deck! 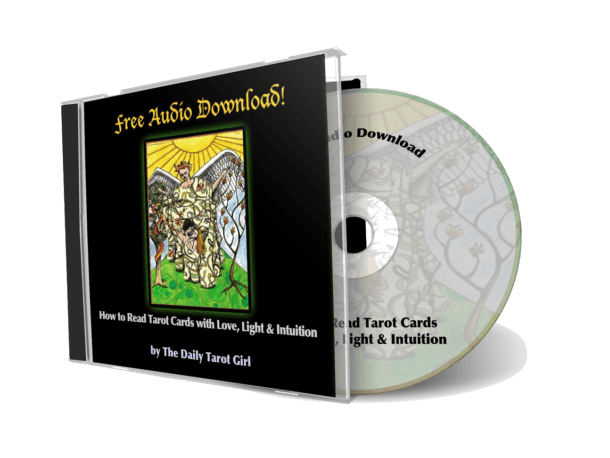 Mystic Faerie Tarot – I love it! Chinese Tarot – US Games recent purchase and adorable. Honorary mentions, as these are apps. Joie de Vivre Tarot and Tarot of the Hidden Realm. I have got the idea of getting decks from you. Hezicos being one of them. I purchased the Anna K and Dream Enchantress Tarots after seeing you read with them! Sadly, both gifted as I felt disconnected to them. On a plus note, the Happy Tarot is in its way!! https://youtu.be/6uyVpjqtNHk Happy Tarot unboxing. I only give decks to a loving home. My go-to decks are the Alchemical Tarot and The Tarot of the Sevenfold Mystery by Robert M. Place. There’s something comfortably RWS about them, and at the same time, the artwork and symbolism feel so deep and inspiring. I’m super monogamous with the Place decks – and I’m a total commitment phobe! If I’m feeling abstract and sort of magical, I always seem to pick up the Fairy Lights Tarot by Lucia Mattioli. The cards are ethereal and loaded with subconscious imagery – using it always gives me goosebumps! My husband loves readings from the new Prisma Visions Tarot by James Eads. It’s a gorgeous deck…each suit combines to make a bigger picture. 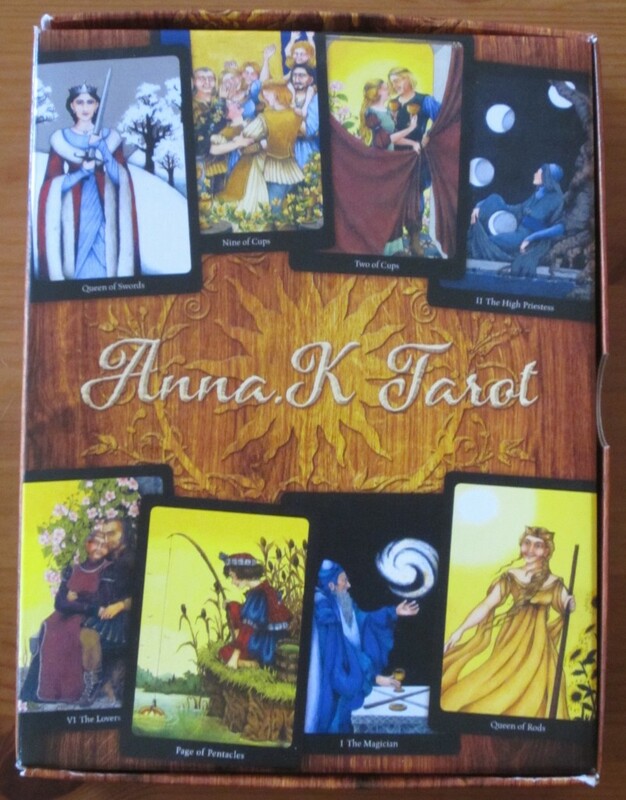 Other favorite decks: Alexander Daniloff’s Daniloff Tarot (it’s stunning and full of powerful, creative imagery – the characters somehow seem “larger than life”), Kat Black’s medieval collage decks, and the Victorian Romantic Tarot by Baba Studios. Thanks for sharing your fave decks! And for the last three spots I’m not so sure. It’d be between Japaridze, Illuminati, Aquarian, Ceccoli, and Baroque Bohemian Cats. I also enjoy the Fairy Tale tarot, but I only have Fools Dog app so I mostly just enjoy reading the companion book sometimes. The RWS has never really been the greatest to look at, but the used version I bought some time ago has a very strong energy to it. What a collection! 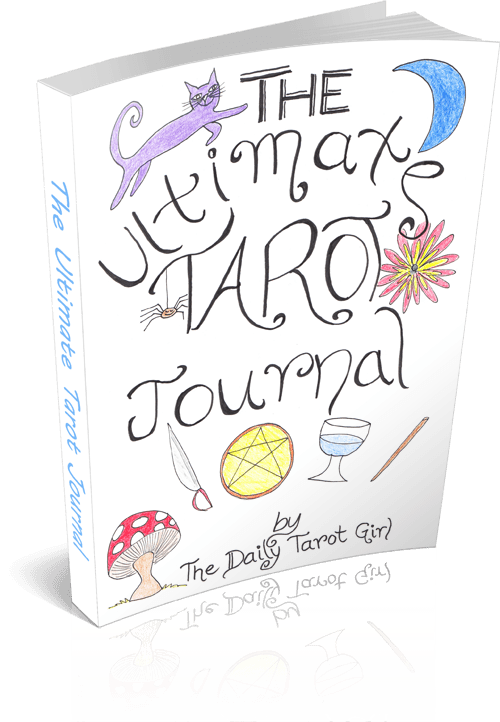 I’m super jealous that you have the Wild Unknown Tarot! My favourite to use is the Fantastical Creatures deck, someone gave it to me as a gift and I have been learning on it ever since. But the Shadowscapes images I saw here are drawing me to looking into it. Hi Kate, Great post! 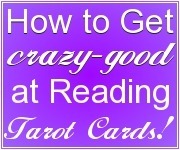 I only have a few Tarot and Oracle decks, and most of them have come from your recommendations…LOL! I love my Druidcraft Tarot– and I actually trimmed that one– and I love it much more without borders. I’m curious as to how you’ve trimmed your Crystal Visions Tarot. I did my best and tried to be exact with the DC, but even my best efforts with a paper cutter (and edge rounder) yielded slightly uneven cards. Is there a way to get hand-trimmed cards close to what a factory-cut deck would feel like? I’m just curious. Also, I just recently bought the Tarot Mucha. It’s such a beautiful deck. I’ve heard that a similar deck (the Art Nouveau) has an 1980’s look to it. This one is just classically beautiful and the artwork is just fantastic. It’s a deck with more feminine energy and characters, I’d say… (but unlike Goddess decks), it does have masculine characters in it which I do like… we are all a mix of masculine and feminine. I also have the CELESTIAL TAROT– lots of blues and soft watercolors here. It’s very ethereal and lovely. The minor arcana is not Rider-Waite in style– but the meanings are very similar to RWS decks. Constellations and mythological beings are pictured on the minors. My favorite part about this deck (aside from the gorgeous Major Arcana artwork) is that it takes me to a spiritual place when I read it. It’s a great deck for more process/psychological/spiritual information. I really love it. My only gripe about both the Tarot Mucha deck (which is brand new) and the Celestial Tarot is that the cards are typical Tarot size and the beautiful artwork and details get lost in the small cards. Both these decks would look beautiful in a larger size. I’ve heard wonderful things about the Prima Visions Tarot (?). Benebell Wen (on her website) has a great review of this deck on her blog. I don’t resonate with the artwork as much, but the concept of the minors creating a flowing panoramic view is so unique! Thanks for posting your decks! Love your blog!! No, I don’t have any good tips for you on trimming your deck. My trimmed decks are all a bit uneven too. Good to hear you love the Tarot Mucha, I’ve heard lots of good things about that deck – I will have to check it out! This is a great post! I have heard good things about the Osho Zen deck…and some of the others listed here are peeking my interest…but my favourite is hands down Stephanie’s Shadowscapes and so I’m happy to see it on your list.